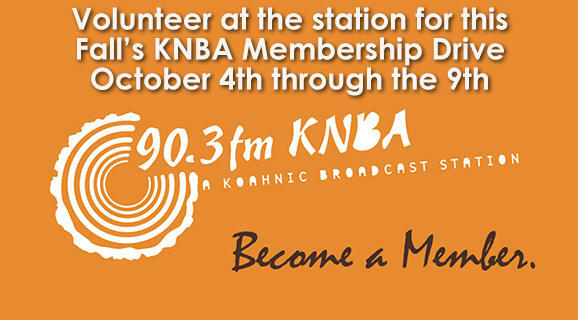 Have fun volunteering at the station for this Fall’s KNBA Membership Drive October 4th through the 9th. 90.3 KNBA, Music Matters! Have fun Volunteering at the station for this Fall’s KNBA Membership Drive October 4th through the 9th. Every year hundreds of listeners pledge support to their favorite public radio station to keep the Great Music and Native programming on the Airwaves throughout south central Alaska. Let us know you would like to volunteer to answer phones and take pledges during the Fall Membership Drive by calling 793-3528 and we’ll see you here!